Richard Ford Sturges was a Birmingham, England, maker of Britannia metal wares. He started out in partnership with his mother, Elizabeth, and continued on his own account from 1841 until his death in 1859. The company made Britannia metal, which is a pewter alloy formulated for fabrication (rolling, pressing, spinning, etc) rather than casting. Seen here is the front of the can with the words "SHAVING CAN" printed in black. 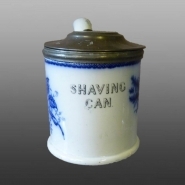 An earthenware handled "Shaving Can" printed in flow blue with a Britannia metal lid. (See the additional image below.) It was made for Richard Ford Sturges. The company added the customized metal lid and marketed the product. The mark on the can is for the Richard Ford Sturges Company. The maker of the can itself is unknown.